Inspired by the writings of the German naturalist, Alexander von Humboldt, Church travelled to South America in 1853 with Cyrus Field, who would later be known for promoting the trans-Atlantic cable, and again four years later with the artist Louis Rémy Mignot. 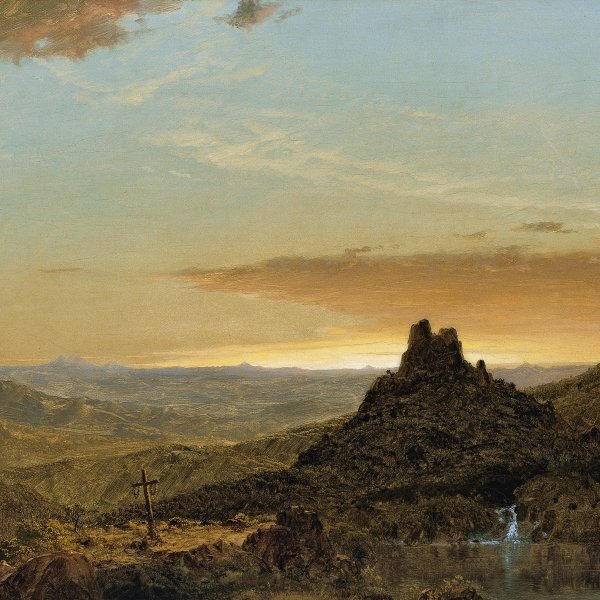 While Tropical Landscape is undated and unsigned, according to Church scholar, Gerald Carr, it likely comes out of his first trip to South America and most closely resembles View on the Magdalena River (1857, The Manoogian Collection), painted shortly before Church's second trip. Church's journey to Colombia was not without fatigue and hardship as he ascended the Rio Magdalena by canoe and travelled over land by mule, but as the 19th-century critic Henry T. Tuckerman relates, these "trials were soon forgotten, when the splendours of an exuberant and radiant vegetation burst upon his sight, and he was enabled at leisure to explore scenes of alternate wildness and luxury, full of novel effects and suggestive traits for the pencil." Writing in his journal in Spanish, a language he was newly acquiring, Church expressed his delight in the "vegetacion exúberante y verde" he discovered along the Rio Magdalena, noting at one time: "Hoy el exuberancia del vegetacion ha deleytandome mas que en qualquier tiempo antes." 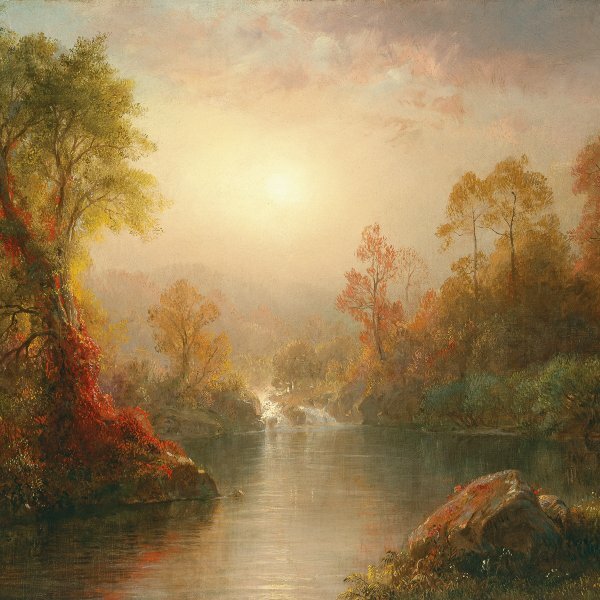 Paintings from his first expedition to the Southern "terrestrial paradise" were warmly received by New York critics when exhibited at the National Academy in 1855. La Magdalena (Scene of the Magdalene, 1854, National Academy of Design) was considered by one reviewer to be a "most elaborate and apparently most truthful portraiture of that marvellous tropical vegetation, which bedecks the river-banks." 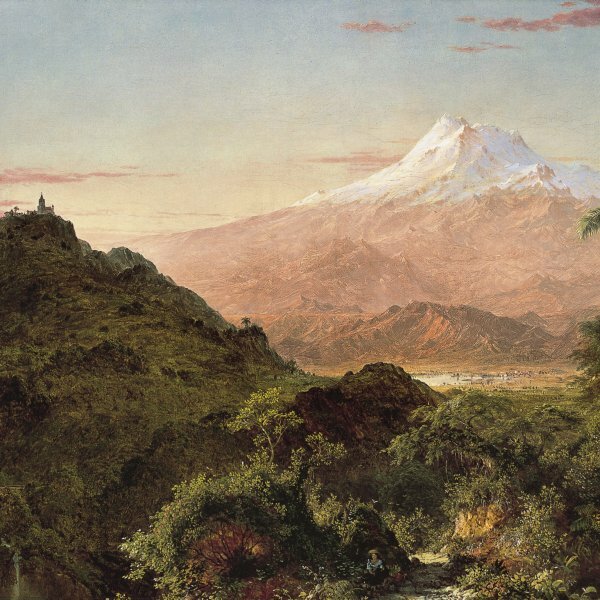 While no extant drawing directly relates to Tropical Landscape, a number of studies Church made on his May 1853 journey along the Rio Magdalena are suggestive of its scenery. Church was particularly attracted to the immense trees with their spreading foliage as seen in the right middle distance of his canvas. On one drawing made of a similar tree (Cooper-Hewitt Museum, 1917-4-850) he noted: "massive tree, longitudinal / masses with many openings showing / the sky between." A similar umbrageous tree is found in View on the Magdalena River, which also shares the palm tree on the left and boatmen in the foreground, but whose background is distinctly different. Church's Tropical Landscape is likely a synthetic view distilled from the experiences of his journey. As in many of his paintings of the South American landscape, including his 1858 study (Olana State Historical Site) for his masterpiece, The Heart of the Andes (1859, The Metropolitan Museum, New York), a single palm dominates the composition. The palm strengthens the identification of such tropical scenes as an Edenic paradise. Church's teacher, Thomas Cole, had included towering palms in his allegorical painting, The Garden of Eden (1828, Amon Carter Museum, Fort Worth, Texas), which drew upon Milton's verses for its inspiration; and although not specifically identified as the Tree of Life, the palm was often equated with it. 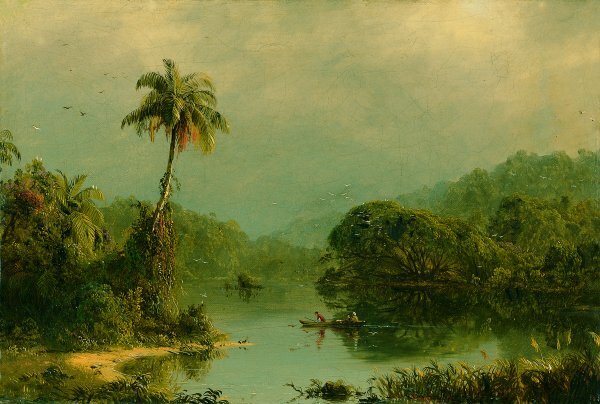 Nineteenth-century viewers of Church's paradisiacal landscapes of the tropics expressed little doubt that they were viewing "the garden inhabited by man before his fall."